Within weeks of Ford and VW announcing their collaboration on commercial vehicles, Automotive News Europe reported that Tesla and Mercedes are in similar discussions. 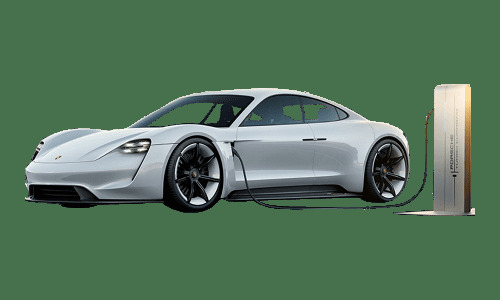 It is not the first time that Tesla and Mercedes collaborates, the companies have a long history together spanning from Mercedes white knight shareholding in Tesla and the EV producer assisting with the powertrains of the first Mercedes EV. 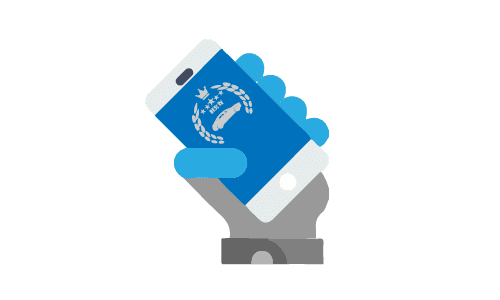 The latest interaction was flamed by a tweet from Elon Musk in November 2018 praising the Mercedes Sprinter van. Mercedes is releasing an electric version of the Sprinter, the eSprinter later in 2019. The eSprinter will benefit from a successful conclusion of talks as it currently only has a range of around 150km (93 miles). Over the past couple of weeks, we saw many automakers announcing their electric car line-ups for the 2019 Geneva International Motor Show (GIMS) such as the Honda Urban prototype and VW ID Dune Buggy. This week we saw more glimpses of electric cars to expect at the Geneva auto show, including some Chinese EVs. One year after announcing the creation of it’s EV specific luxury brand called Lagonda Aston Martin announced that it will debut its All-Terrain EV Concept due in 2021 at the 89th Geneva International Motor Show. The Lagonda All-terrain EV is based on the Vision Concept (right in the image below) introduced at last year’s GIMS. 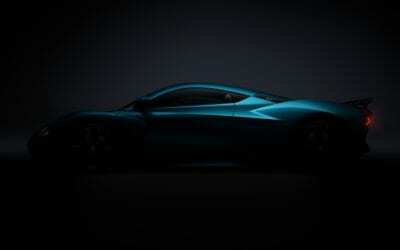 The Chinese automaker BAIC BJEV in which Daimler owns a 4% stake will unveil a crossover concept EV and the second generation of the Arcfox 7, its electric supercar first unveiled in 2016. To date, the Arxfox brand has only one production model and that is the Arcfox Lite or Arcfox 1 as it was first known. Sales for the premium high tech Arcfox Lite is surprisingly week in the popular small car segment in China, to date only 588 units of the Arcfox Lite were sold. The second generation Arcfox 7 was first unveiled on the 3rd of September 2018 in Barcelona Spain. It is not clear if BJEV’s appearance at the Geneva International Auto Show heralds its entry into the European market. 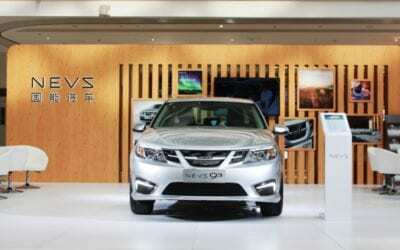 BJEV and the Canadian company Magna entered into an agreement earlier to jointly develop EVs at a plant in Zhenjiang from 2020 while Daimler is in talks with it to assemble the smart ED for the Chinese market. VW announced that the 2020 Passat would make its debut at the Geneva Motor Show, including the Passat GTE, its plug-in hybrid electric vehicle. Pre-sales for the VW Passat GTE PHEV will start in May 2019 and the market launch will take place in September in Germany. The Passat GTE is equipped with VW’s new “Travel Assist” advanced driver assistance system making the Passat GTE the first VW models with automated driving capabilities. Travel Assist is available at any speed up to 210km/h through the new IQ.DRIVE system. VW was forced to discontinue sales of the Passat GTE after the introduction of the WLTP test cycle in September 2019. The 2020 Passat GTE sports a consideredly better battery-only driving range of 55km (34 miles) as measured on the new WLTP cycle, which is around 70km on the old NEDC cycle. The Chinese automaker BYD is following in the footsteps of its competitor SAIC Maxus by entering the European market with a pure-electric delivery van. The BYD T3 EV van has 3,500 L of cargo space and a range over 200km (125 miles). BYD showcased the T3 EV van with two commercial electric vehicles in Spain, all destined for the European market. The other two commercial vehicles are the 7.5 tonnes T6 truck and Q1M Yard Tractor with its gross combination weight rating of 46 tonnes. Renault will launch its latest version of the popular Zoe EV in April 2019. The new Zoe S Edition is available in two power configurations, the Q90 with its 64kW (87 hp) electric motors and the more powerful R110 with a 79kW (108hp) electric motor producing 225N.m of torque. The Zoe S has a range of 300km (188miles) as measured on the WLTP scale and is equipped with a 65kW charging system which can fats charge to 80% in 65 minutes. 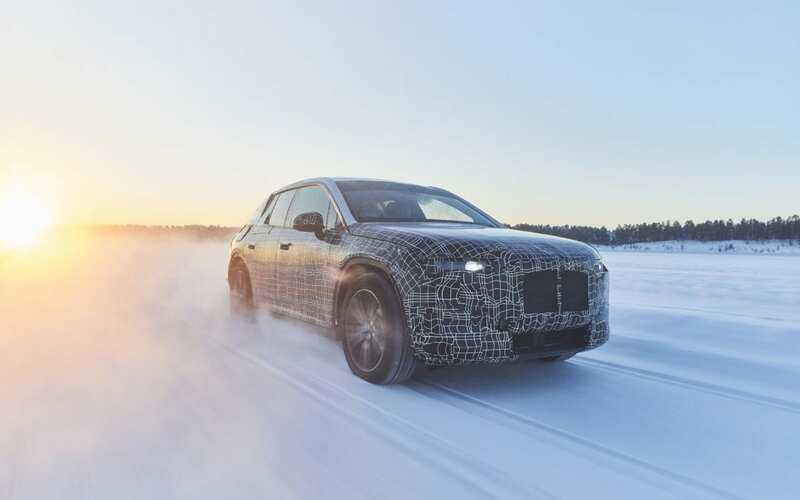 BMW announced that it completed winter testing of the much anticipated iNEXT SUV due in 2021. The iNEXT SUV underwent testing in Sweden to analyze how the electric vehicle re-charges, how electricity is transferred to the electric motor, how the electrical system is supplied with energy and how the heating and air condition systems respond. Earlier the week the AAA stated that electric vehicles in the USA suffered a drop of around 40% in range during the freakish cold snap experienced there, mostly due to the HVAC heating system draining the battery pack, a claim refuted by Tesla. GM CEO Mary Barra warned investors in the company’s 4th quarter earnings call earlier this week that the company’s electric car strategy will not be profitable till early in the next decade. 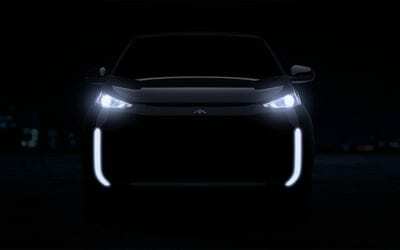 The statement seems to shift the goal posed from her earlier bold claims that GM will turn a profit selling EV’s in 2021 already (Week 2 2019 Top 5 EV News). In the company’s 10-K filing required by SEC GM warned that the auto sector would “continue to experience a significant change in the coming years” due to the shift to new technologies in an uncertain environment due to the disruption caused by electric mobility and automation. 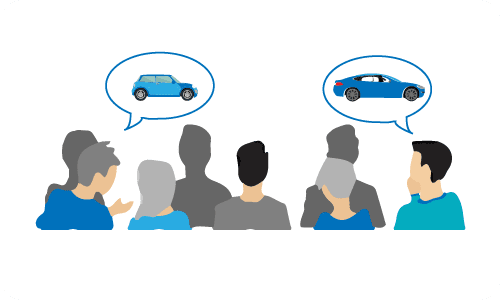 As mention in the Week 2 newsletter GM aims to get ahead of the curve by reducing battery cost and using shared platforms. 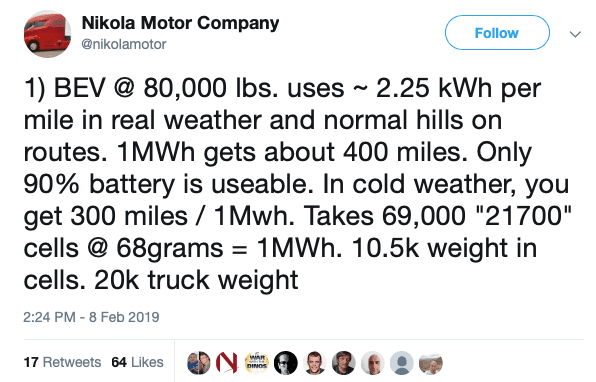 Nikola Motors, the developer of hydrogen-electric trucks tweeted this week that it is also entering the race to bring pure-electric trucks to market. In a tweet in the run-up to the company’s annual event called Nicola World in April 2019 the company said it will also unveil an electric class 8 semi with a range of 400 miles. According to industry commentators, the shift towards battery powered trucks is due to the interest that the Tesla Semi 8 has received since its unveiling. Nikola Motors claim there is a space for both technologies but that it will remain a 50 to 1 ration in favor of fuel cell trucks. Nikola is a bitter rival to Tesla and has filed a lawsuit against Tesla for patent violations, claiming damages of $2 billion. Nikola’s success is dependent on a robust hydrogen charging network, which to date has been challenging, with hydrogen shortages causing Toyota to provided rented vehicles to its Mirai FCEV users in 2018.